Aircraft Doors Market size is anticipated to surpass USD 9.5 billion by 2025; according to a new research report by Global Market Insights, Inc. Rising air carrier fleets owing to increasing air passenger traffic will augment aircraft doors market growth over study timeframe. As per the International Air Transport Association (IATA), in 2017, the passenger traffic rose to 4 billion and increased by over 8% compared with 2016. Air carrier manufacturers such as Boeing, Bombardier, and Airbus are upgrading their manufacturing facilities to meet increasing demand and previous production backlog. For instance, in November 2018, Airbus jetliners production backlog stood over 7,300. Airline manufacturers are focusing on reducing the overall air carrier weight to enhance fuel efficiency and profitability. Government entities are taking initiatives to adopt innovative materials for structures. For instance, in 2014, European Union funded research to incorporate carbon nanotubes for producing lightweight and cost-effective structural parts including landing gear door. Rising prominence for weight reduction solutions in air carriers will drive aircraft doors market size over the forecast timeline. Organizations including International Civil Aviation Authority (ICAO), Federal Aviation Administration (FAA), and United States Environmental Protection Agency (EPA) govern the adaption of structures in aviation industry to check the carbon emission from airlines. In March 2017, ICAO adopted CO2 emission standards for reducing greenhouse gas emissions. Further, FAA enforces an advisory circular 25.783-1A stating the fuselage doors requirements to ensure passenger safety. In 2018, commercial aircrafts accounted for over 45% in aircraft doors market size owing to continuous increase in airplane deliveries. According to CAPA, in 2017, the commercial airlines deliveries rose to over 31,000 with an increase of around 4% as compared to 2016. Moreover, rising disposable income in conjunction with annual spending in emerging nations is scaling up the air carrier deliveries thereby enhancing the market share. Hydraulic operating mechanism will register around 5.5% CAGR by 2025 owing to growing adoption of automatic actuation mechanisms for easy operation. The system allows superior accuracy and require less maintenance. 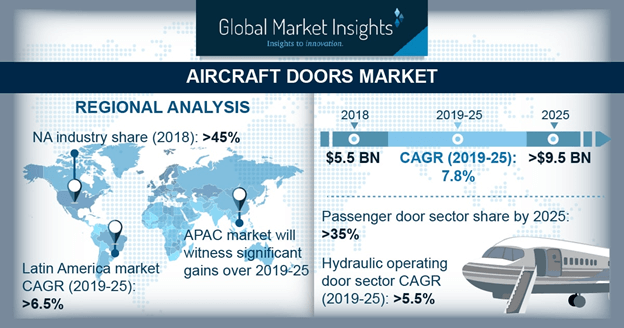 Ongoing innovations offering high power to weight ratio and self-contained systems will induce significant potential in hydraulic aircraft doors market size. However, rising concerns for system reliability in adverse weather conditions will limit its growth in aircraft doors marketplace. OEM holds significant share with door installation during manufacturing. Component manufacturers are adopting innovative solutions to enhance time and cost efficiency of supply chain. Moreover, industry players are integrating supply chain to reduce complexity and ease material availability at each stage. Aftermarket segment will project a robust growth owing to the requirements for air carrier system replacement and continuous maintenance to ensure correct operation and passenger safety. North America dominates aircraft doors market size owing to the presence of major airplane manufacturers such as Bombardier Aerospace, Boeing‎, and Lockheed Martin. Moreover, presence of large number of airports handling large traffic will positively influence the product demand. Asia Pacific will exhibit a robust growth with improving economic conditions and emergence of low-cost carriers. Latin America aircraft doors market share will witness over 6.5% CAGR over study timeframe with rising aircraft fleets. Airliners are continuously expanding commercial and regional jet fleets to accommodate larger number of passengers. For instance, in July 2018, Embraer received an order of over 20 regional jets from Azul Linhas Aereas Brasileiras. Middle East & Africa is at nascent stage and bound to witness significant growth owing to proliferating tourism industry. Aircraft doors industry is consolidated with presence of major market participants including Latecoere, Saab AB, Mitsubishi Heavy Industries, Elbit Systems, and Aernnova Aerospace S.A. Manufacturers are strengthening their R&D capabilities for developing innovative solutions incorporating advanced mechanics and electrical actuation. For instance, in 2017, Latecoere introduced NexGED door under the ASGARD project substituting mechanical parts with electric activation. Moreover, industry players are undergoing strategic collaboration with the airplane manufacturers for providing customized solutions.